« What is With Those Tuttles? While many stories about Aunt Fran indicate that she was not an easy woman to get along with, some family members have good memories of her. Her Godson Tommy Mancinelli (grandson of Aunt Dot and Joe Mancinelli) remembers her as kind and attentive. When she kept Tommy and his sister Theresa overnight, she always came into the bedroom to take their pillows away, because she feared that they would otherwise smother in their sleep — and she did this until he was ten years old. Later Tommy did small jobs for her as a teenager and she always showed concern for his welfare. Skippy Brichter, Aunt Ann’s son, also had many positive memories of Aunt Fran. –All the photographs in Fran’s apartment had one thing in common: the face of one of her sisters was scratched out. I believe it was Ann, but I am not sure about this. –Uncle Freddy, who was the soul of generosity, worried about Aunt Dot, who had severe financial difficulties for most of her life. At some point he went to Fran and said he wanted to help Dot, but as is not unusual for Italian men of that generation, he wanted to do it indirectly. Every month he would give Fran twenty dollars for Dot. This went on for many years. At some point it became clear that Fran had done as her brother asked, but passed along only half the money every month. She kept ten, and passed on ten to Dot. Because Fred and Dot never talked about this, no one was the wiser. How the truth eventually came out is unclear. Fran is second from right standing with Irene on one side, and Uncle Luigi Alfonso, visiting from Italy, on the other. Ca 1960. It seems that Fran felt both entitled and short-changed. She resented what others had, and was willing to take what she felt she was owed. The nature of her feud with Ann (if that is the right sister) is unknown to me. Italian women can get a good grip on a grudge, and rarely let go. You know I left Newburgh a long time ago, 1963 it was or 62, and I didn’t know what was going on in Newburgh, I never heard about all the arguments and bickering. I was sensitive, always the first to cry. But one time when I was in Newburgh the same time as Kate, I said to her, I said, I don’t know what happened exactly, I don’t know the details, but I do know that for years Ebby put you up on a pedestal, and now … I don’t know what you said to her, but it’s not right. And Kate looked right at me and said, I didn’t do a single solid thing to her. You know, proud, the way she did. But they did, they were cruel, her and Fran and Ann, too, she was part of it. I don’t know what made them so mean. It was after Ma and Pa were both gone that it really started, but I can’t say why. Ebby and Kate were very close when Ebby was a little girl. But then Kate and Fran were so mean to Ebby when she needed them most. It was awful. Ebby would call me and cry and cry about it. She said, they talk about me as if I wasn’t even there. They say terrible things about me. It was about her son, you know, because he was queer, homosexual. They wanted her to reject him, to throw him out. She wouldn’t. She said, he’s my son, whatever else he is. And they were so cruel to her. You know he was living in the little apartment on the left side, on the bottom, at Ann Street, and Fran made him move out. Forced him out, though she didn’t have no right. Made him miserable and he went. This, of course, goes far beyond quarrels and childhood resentments. Aunt Fran caused great suffering for her nephew Chuck Stevens, and for her sister, his mother, Evelyn, called Ebby by the family. A less anticipated side of Aunt Fran’s life came to the fore after a newspaper search. Between about 1935 and 1938, while still unmarried, she spent considerable time in Tarrytown in Westchester County, about fifty miles south of Newburgh on the other (east) side of the Hudson. Uncle Joe was living in Tarrytown for at least part of this time, and Aunt Anna moved there when she married Stephen Brichter. Tarrytown was socially very active, and the newspapers reported on details. So Fran was living in Tarrytown, and very much involved in social events — as was Ann. There are other mentions of Fran in Tarrytown, in particular of a serious car accident in which both she and Stephen Brichter were injured. I will look more closely at the newspaper stories about Aunt Ann and Stephen Brichter in a separate post. Fran’s life wasn’t without personal tragedy. She was married, but had no children. Her husband, William O. Pushman died in a hunting accident shooting when he was fifty-five. The article from The Journal News (White Plains, New York) · Monday, Aug 17, 1959 · Main Edition can be seen here. There is one aspect to Fran’s life that bears consideration, and I believe few were aware of this history. It has to do with birth order and the oldest four children of her generation. 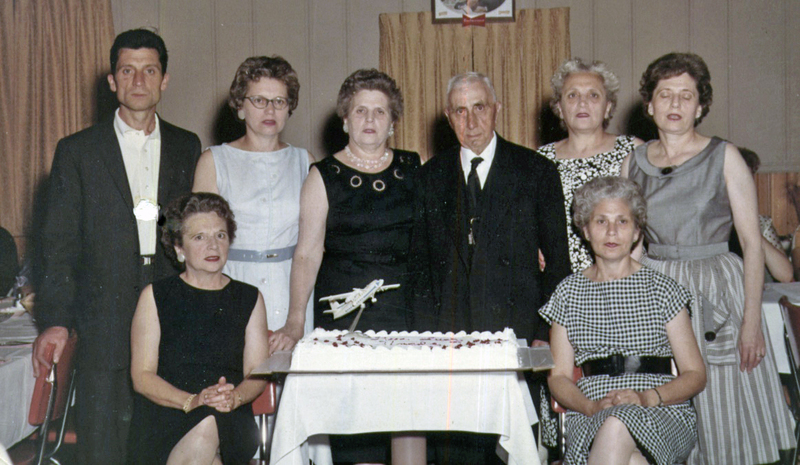 1903-1904 Sometime after Fran was born, Rose, her mother-in-law Caterina, and the three children traveled to Italy and took up residence in Stella Cilento, leaving Fred back in Newburgh. As far as I am aware, there is no one living who could throw any light on this unusual circumstance. 1905, June On June 21, 1905, Rosina Russo Lippi arrived back in the port of New York on the ship Prinz Oskar, traveling with her daughter Alfonsina, age twenty-two months. Joe and Kate stayed behind in Stella Cilento with their grandmother Caterina. 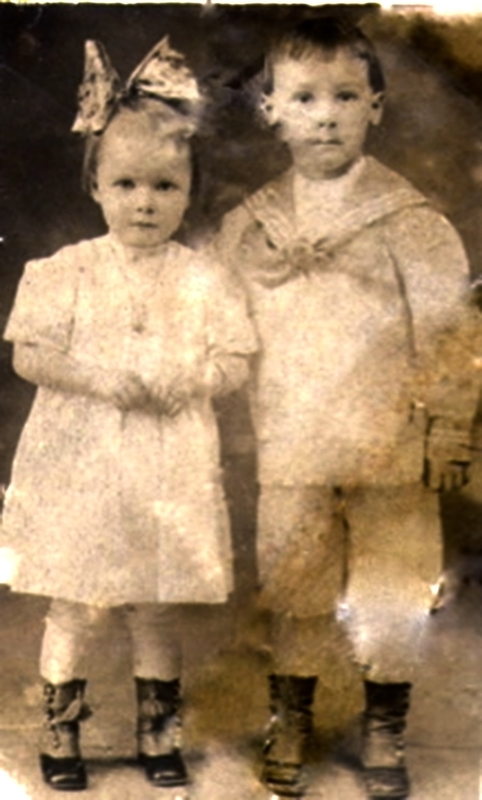 1906, March Almost exactly nine months after returning to Newburgh, Rose gave birth to Louie. Fran was five months shy of three. 1907, July In late July of 1907 Caterina returned to New York on the U.S.S. Hamburg with Joe, who was now six, and Kate, almost five. At this point Louie was fourteen months old, Fran almost four years old, and Rose was pregnant with Dot. Note that at almost two years old, Fran suddenly had her mother to herself. All through the summer, fall and most of the winter of 1905-1906, she had all the benefits of being an only child. Then, in March Louie was born, and she will have gone through the normal adjustments in such a situation. A year later, her world was again turned on its ear when her older brother and sister and a grandmother returned to join the family in Newburgh. It’s unlikely that Joe and Kate spoke English at this point, but Fran probably spoke little or no Italian. It isn’t hard to imagine that this was a shock to a four year old, who had had her mother mostly to herself for about two years and would have no memory of Joe or Kate, who would take precedence. Almost certainly there would have been jealousy and resentment. These early events will have had significant effects on her.